Winners will be honored at the Golden Bridge Awards Dinner and Presentation in San Francisco on October 2, 2012. These nominations are a testament to Nutricap Labs’ unyielding commitment to building long-term and successful relationships with our clients by providing them with innovative products and outstanding customer service. Nutricap Labs, a leading provider of in-house supplement manufacturing, label and packaging design and fulfillment services, is pleased to announce that members of its executive team have been recognized as finalists in the 4th Annual Golden Bridge Awards. The coveted annual Golden Bridge Awards program, with active participation from a broad spectrum of industry voices, encompasses the world’s best in organizational performance, products and services, innovations, executives and management teams, women in business and the professions, case studies and successful deployments, public relations and marketing campaigns, product management, websites, blogs, white-papers, videos, advertisements, creativity, partner programs, and customer satisfaction programs from every major industry in the world. Organizations from all over the world are eligible to submit nominations including public and private, for-profit and non-profit, largest to smallest and new start-ups. Winners will be honored in San Francisco on Tuesday, October 2, 2012 during the 4th annual awards dinner and presentations. Globee Awards from Silicon Valley are conferred in four programs: The Info Security’s Global Excellence Awards, The IT Industry’s Hot Companies and Best Products Awards, The Golden Bridge Business and Innovation Awards, and Consumer Products Guide’s World Choice Awards. These premier awards honor organizations of all types and sizes from all over the world including people behind them, the products, performance, innovations, public relations and marketing. 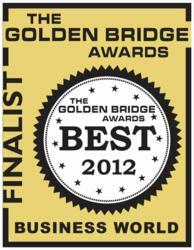 Learn more about The Golden Bridge Awards at http://www.goldenbridgeawards.com. Nutricap Labs is a full-service supplement manufacturer that specializes in the production of tablets, capsules and powders. We also provide in-house graphic design, packaging and order fulfillment services to our customers. We are a 4-time Inc. 500 | 5000 honoree and have received multiple accolades from leading business and entrepreneur advocates such as Ernst and Young, The American Business Awards and Best In Biz. For more information about our services, call (800) 494-6154 to speak to a product advisor or submit your request to receive a free nutraceutical manufacturing quote from us in 48 hours or less.